Las Cruces High School has one napping pod, which students use for 20 minutes when they are tired, stressed or angry. 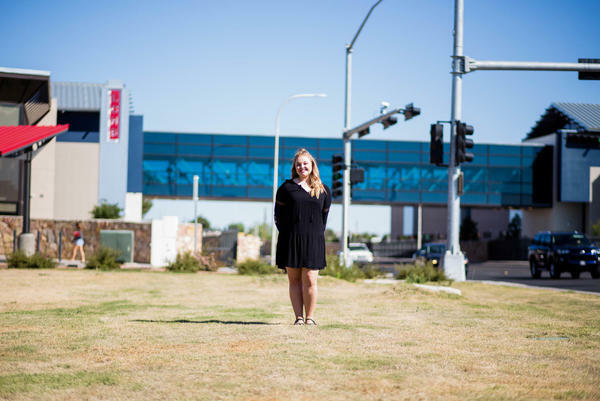 Vanderkooy is a senior at Las Cruces High School. She says she typically gets only four to five hours of sleep a night. Studies have shown teenagers actually need between nine and 10 hours of sleep a night. But the vast majority (69 percent) aren't getting it. Enter "napping pods." They're essentially egg-shaped lounge chairs that recline, with a circular lid that can be pulled over the chest to shield against light. "It just sort of envelops you in a really nice darkness, with soft lighting behind you," says Vanderkooy, a frequent user of the pods. She says she typically gets only four to five hours of sleep a night. There's soft music playing in the pod and "you just feel extremely relaxed," she says. The 20-minute experience is a wonderful "oasis" amid all the worry and stress of school, she says. "Being a senior, I have to apply for scholarships, do all my homework," she says — noting that she's taking three advanced placement courses. "So my sleep cycle has just sort of become this night-owl life, and it's just kind of the new normal." A nap can't substitute for a good night's sleep, but it certainly can help, says Dr. Nitun Verma, a sleep specialist and spokesperson for the American Academy of Sleep Medicine. A short nap for a teenager "can give a boost to memory and attention during the day, and it can increase school performance," he says, adding that in a perfect world, schools would roll back their start times. As it is now, the average school starts at 7:30 in the morning while the start time recommended by researchers at the Centers for Disease Control and Prevention is 8:30 a.m. or later. On top of that, teens' circadian rhythms work against them — coaxing them to stay up late and then sleep late. So they are already sleep-deprived and "waking up much earlier than normal," Verma says. Several public schools in New Mexico are trying to tackle the problem by providing napping pods for their students. "We know lack of sleep changes mood and makes you more anxious," says family nurse practitioner Linda Summers, who is an associate professor at New Mexico State University's school of nursing in Las Cruces. Summers also works with the nearby Las Cruces High School health center, and has seen firsthand the effects of sleep deprivation on students there. So she decided to apply for a federal health grant to buy the pods, which, at the time, cost $14,000 each. They were installed in four high schools. And while the Las Cruces school napping pods were bought to remedy sleep deprivation, Summers says, "it also turns out to be good for anger and stress." Even if kids don't fall asleep, but simply "zone out," she says, they emerge saying they feel "refreshed and calm." This led Summers to embark on a study looking at the emotional impact of pods. She recruited students who reported feeling "agitated or upset about something," and had them describe their feelings before and after spending 20 minutes in the pod. "They all felt more rested, happier and more in control of their emotions," she says, "after just 20 minutes." Summers now writes prescriptions for the nap pod for students who are anxious, angry or just plain sleepy. The findings haven't been published yet, but they have been accepted for publication by a peer-reviewed journal. Summers says the teachers and school nurses she works with already see the pods as a big success. Each capsule is sort of a "therapeutic study hall," she says, that helps students focus better when they're in the classroom. Vanderkooy recalls falling asleep in one of her classes and being told by her teacher that she "really, really" needed to go take a nap. "I came back and I was awake and attentive," she says, able to take out her notes and proceed — "just like a normal class." Preventing yawning in teenagers - and one way to do it is to take a nap at school. And there's some public high schools in New Mexico actually providing napping pods for students. Here's NPR's Patti Neighmond. PATRICIA NEIGHMOND, BYLINE: They look like egg-shaped space capsules. HANNAH VANDERKOOY: You lay in it, and it starts to recline. NEIGHMOND: That's Hannah Vanderkooy, a senior at Las Cruces High School. VANDERKOOY: The shell comes over, and it just kind of envelops you in like a really nice darkness. But it's not too dark - you know? And they have, like, little soft lights behind you and, like, soft music that plays. NEIGHMOND: Legs elevated, lower back relaxed - all designed to induce calm and hopefully a little sleep. The 20-minute interlude in a very busy, stressful day is a welcome relief for Hannah, who typically gets only four to five hours of sleep a night. VANDERKOOY: Being a senior, I have to apply for scholarships. And I have to do my homework, and I have to do all this. And so my sleep cycle has just kind of become this night owl life, and it's just kind of the new normal. NEIGHMOND: Hannah says she's not alone. Lots of her friends are on a similar schedule. Dr. Nitun Verma is a sleep specialist and spokesperson for the American Academy of Sleep Medicine. He says a nap can't substitute for a good night's sleep, but it can certainly help. NITUN VERMA: A short nap for a teenager can give a boost to memory and attention during the day. It can increase school performance. NEIGHMOND: Nurse practitioner Linda Summers works with Las Cruces high schools. It was her idea to apply for a federal health grant to buy pods for four schools. They cost $14,000 apiece. She says they're worth it because lack of sleep makes students more easily upset, anxious and even angry. In these cases, she will often write a prescription for the napping pod. LINDA SUMMERS: You need to do this twice a week. You need to do this before you have a fight with somebody or you have a test and you haven't slept. NEIGHMOND: And, Summers says, teachers also recommend students take a short nap. VANDERKOOY: I was falling asleep in one of my classes. And my teacher, instead of scolding me, he was like, you really, really need to go and take a nap - because it's not really like me. NEIGHMOND: After 20 minutes in the pod, Hannah says she returned to class refreshed. VANDERKOOY: And I came back. And I was awake and attentive and took my notes and, (laughter) you know, just like a normal class. NEIGHMOND: Teachers and school nurses report the pods are a big success, sort of a therapeutic study hall that helps students focus better when they're in the classroom. And nurse Linda Summers says the pod experience just makes the kids feel better. SUMMERS: If you don't fall asleep - if you just zone out, which a lot of the kids say they - that happens to them, they also feel refreshed and calm. NEIGHMOND: Summers is also a researcher at New Mexico State University. She recently did a study asking 100 students who said they were agitated or upset about something how they felt before and after spending 20 minutes in the napping pod. SUMMERS: They all felt more rested. They all felt happier or more in control of their emotions - after just 20 minutes. NEIGHMOND: So not only are the pods a place to catch up on sleep, they also provide a small oasis of calm for stressed-out students. Patti Neighmond, NPR News. Transcript provided by NPR, Copyright NPR.